I was just sorting through my sewing box to find more pink 'cherry' buttons for my cupcakes and I came across this ribbon. I had completely forgotten that I had bought this one. I now can't wait to use it and think that I shall be adding to my 'With Love' card collection with 'Congratulations' cards in a similar style. I have also been thinking of putting my cupcakes on cards so this seems like the perfect opportunity. I shall post the results for you to see as soon as the cards are ready. I had a range of brightly coloured make-up bags in my Not on the Highstreet shop which proved very popular and sold out quickly. 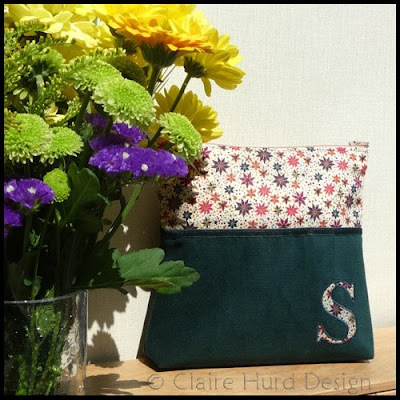 I am now replacing those bags with personalised versions (please click here to view design currently available). A close friend of mine had always admired the brightly coloured bags I had produced so I made her a special one-off version for her birthday. I love these colours together, they really remind me of summertime and the seaside. In a change from my usual textiley posts I thought I would show you something else I have been making. 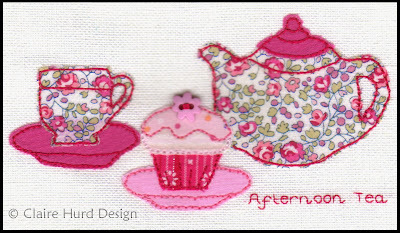 I really love cupcakes - as I am sure you can tell from my various tea time themed and fairy cake style artworks. I am currently a particular fan of these mini muffin sized cupcakes (my partner jokes that I love anything that is in miniature!). These particular cakes were to take along to my Godson's christening. He is still a little young for cakes but his older sister certainly enjoyed them! 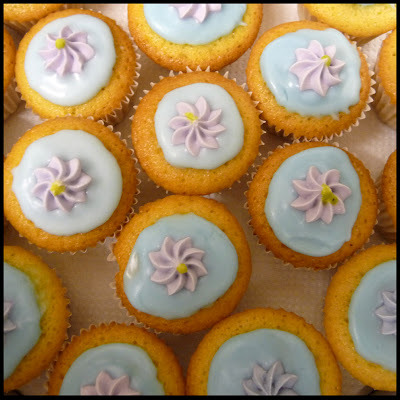 I think that I have made enough cupcakes like this now to justify a cupcake cook book to give me ideas for something new. I am tempted by the Hummingbird Bakery Cookbook at the moment. If anyone knows of a good cake making book then please let me know. 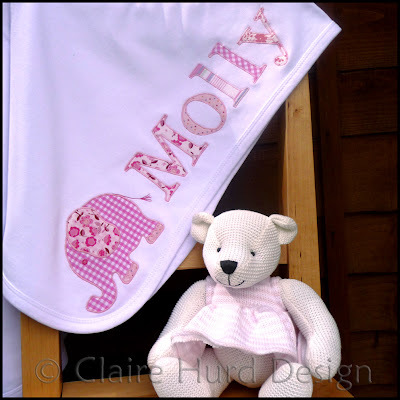 Personalised Baby blanket for a Baby Girl! 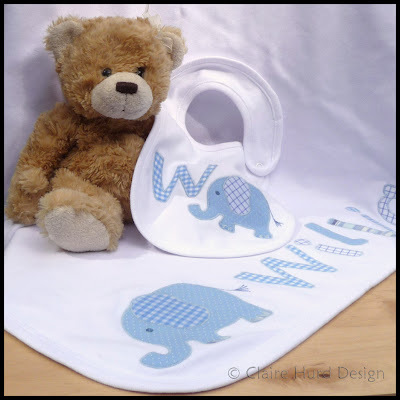 Since introducing my personalised baby blankets I had strangely only had commissions for baby boys. Happily in this last week little Molly was born and I had a commission for a baby girl's blanket. 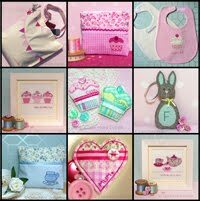 It was nice to get out my pink fabrics and select nice girly prints for this order. My customer was really pleased with the final blanket and very happy to get it at my current special offer price. I shall be running my special offer of £15.00 for a personalised blanket with free P&P for one more week only so get your orders in quickly! 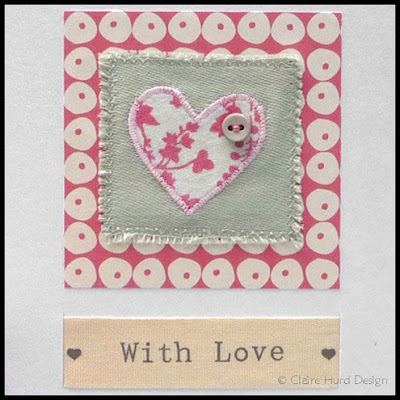 I have just completed a new 'With Love' greetings card for sale in my Folksy shop. 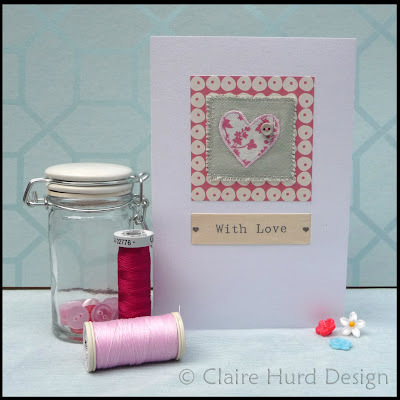 I have created this design by combining an appliquéd heart motif with some pretty printed paper and have mounted them on a pearly white card base. 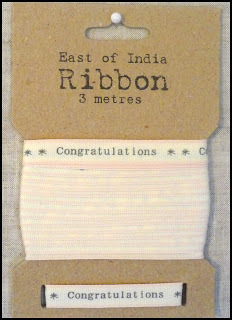 I have finished off the design with a hand applied button and a printed 'with love' ribbon. For more details please click here to visit my Folksy shop. 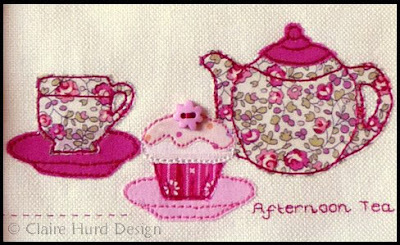 The Afternoon Tea artwork I mentioned in my previous post is now finished and ready for sale in my shop. I have added just a touch more detail since my last post. I have defined the shape of the teapot with a bit more freehand machine embroidery and have added some hand-stitch detail to the bottom left in order to balance the text on the right. This atrwork will be made to order so there is the option to personalise the design and replace the text with text of your choice. For more details please see my shop. Sneaky Peek at New Artwork! I have a new artwork that I will be framing and putting in my NOTHS shop. I will not have time to frame and photograph it before next week but really wanted to show it to you so here is a sneaky peek of my work in progress. Just like my cupcakes artwork that I posted about recently, this framed artwork will be made to order so the text can be changed to a name or personal message. I shall update you when this sample is framed and ready for sale in my shop. 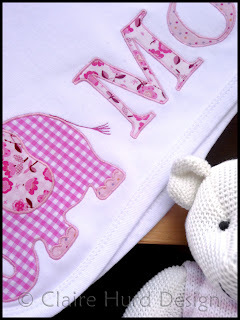 Today I completed my latest personalised baby blanket and bib set commission. 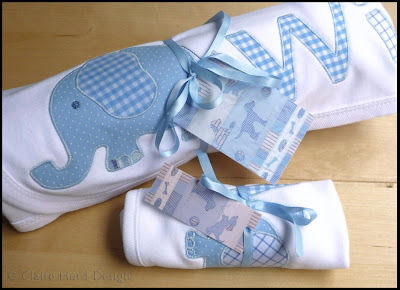 This set is for a little boy called William - I hope he likes it! There certainly seems to be a bit of a baby boy boom going on at the moment! All wrapped and ready to go to their new home. I have had a lovely, inspiring, sunshiney day in Winchester today. I went to visit Handm@de Winchester for the first time and loved what I found there. The craft fair had a great variety of products all of a very high standard and all handmade by the exhibitors. 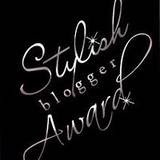 I met fellow blogger and textile designer/maker Monda-Loves who was just lovely. It was great to see her beautiful products that I had been reading so much about. I had a lovely chat with fellow Folksy seller Fabric Nation who had some great products, was very encouraging and admired my handmade bag that I had with me! Having limited myself to just one purchase (in order to avoid being tempted to come home with one of everything!) I bought a really cute and beautifully made bird brooch from fellow NOTHS sellers meninafeliz. Bebe and Anne-Marie were very friendly, full of advice and offered me support in my future venture into craft fair selling should I need it. Thank you to everyone I met today, I came home in a very happy crafty mood. I hope our designer/maker paths cross again in the near future. I have just added a new personalised make-up bag to my online shop. This bag is made with a lovely Liberty print fabric that I have been hoarding for some time now! I have teamed it with a lovely fine bottle green corduroy fabric and some velvet ribbon trim. 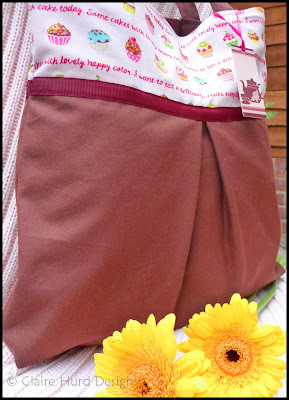 I think the colours look great together and make a nice contrast to my more girly 'sweet treats' cosmetics bag. 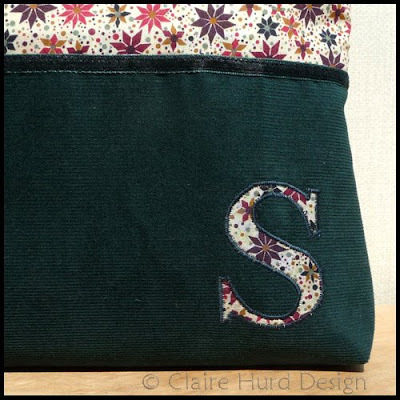 The make-up bag is personalised with a single initial appliquéd in the same Liberty print fabric. The bag has a zip opening at the top and has a full waterproof lining. I have been having a bit of a sort out today and have washed another load of my appliqué fabrics. 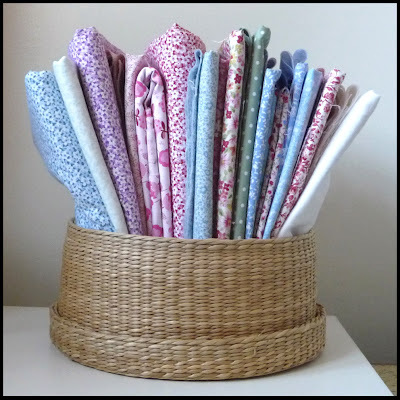 I like to give them a wash before I use them so I know that when I apply them to a product that will be washed in the future (such as my personalised baby blankets) I know that they will not shrink, fade or bleed any colour. This is only a small selection of the patterned appliqué fabrics I have collected over time. I have so many lovely fabrics it makes me excited and impatient to make more embroidered and appliquéd artworks and items for my online shop. I have just completed another bag commission. Just a special birthday card commission to do now before another run of baby commissions begins. This bag has been made to my own summer bag pattern. I have been really pleased with how this pattern turned out and it has proved very popular with customers. Having made quite a few bags to this pattern now I shall be developing it slightly for next season. Just a few tweaks to improve it further. 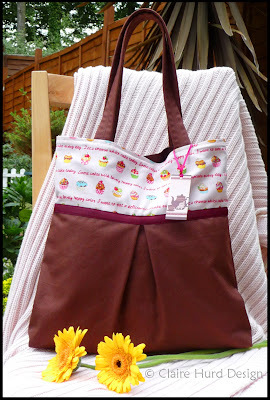 The bag above was made with a sturdy chocolate cotton and some of my sweet treats printed fabric that I ordered from Japan. I have such a tiny amount of this fabric left but am determined to use every scrap as it is really rather cute! 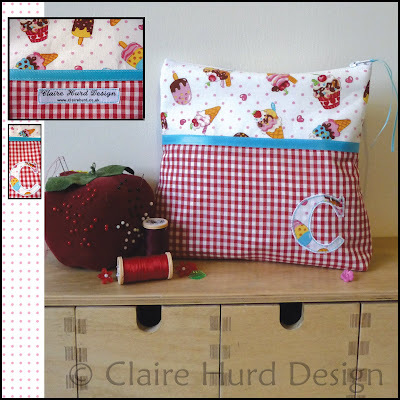 Once again this bag has been fully lined and has a matching sweet treats print fabic pocket and a magnetic fastening. I hope the recipient is really happy with their new bag. 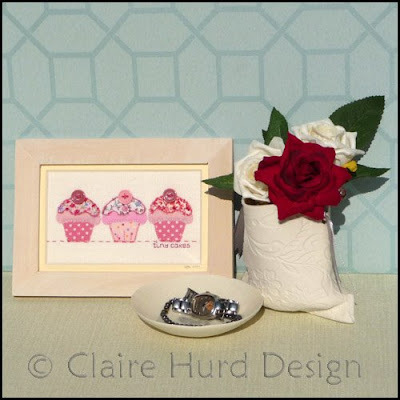 I have just listed a new item in my NOTHS shop - framed hand-appliquéd and embroidered cupcake artworks. 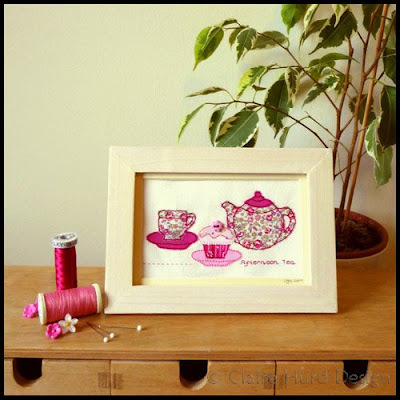 These little artworks are based on details from larger tea party artworks I have created in the past. 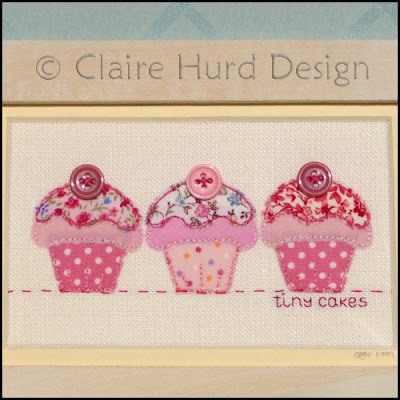 The hand-embroidered text on the artwork shown reads 'tiny cakes' but I am offering customers the opportunity to personalise this product and add their own text. 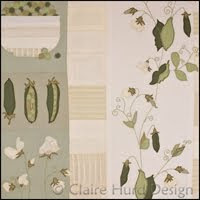 I have used cheery pink printed fabrics for this design; a combination of spots and ditsy florals. The cakes are all topped off with button cherries. The artwork comes framed in a wooden whitewashed frame with a pale lemon mount. The frame is glass fronted and has a metal stand on the reverse.